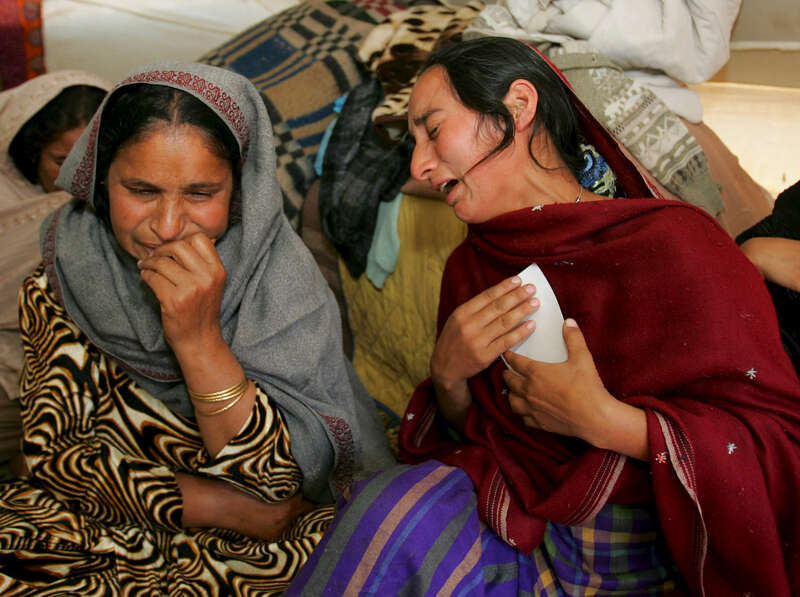 MUZAFFARABAD, PAKISTAN-OCTOBER 22:Naseem (L) and Nazmeen Akther (R) weep as they loook at photos of their children killed in the earthquake inside their tent in Muzaffarabad, Pakistan controlled Kashmir October 22,2005. the mothers joined relatives who visited them today to mourn their loss together. The current death toll is now believed to be over 50,000 from the South Asian earthquake that happened 2 weeks ago. Over 3 million people are without proper shelter and aid organizations including the U.N are warning that thousands could die in remote mountainous regions as Winter approaches. Atleast 1,400 died in Indian-Kashmir.